Making lasagna? Try a pan with homemade ricotta cheese; good lasagna is now outstanding lasagna. Offering the best Italian recipes from scratch and more authentic Italian recipes below. Line a sieve with cheesecloth or a damp paper towel and place over a bowl. In a large, heavy pot over moderate heat, bring the milk, cream and salt to a boil, stirring constantly to prevent scorching. Add the vinegar, reduce the heat to low and continue stirring until curds form, about 3 minutes. Pour the mixture into the lined sieve and let drain, about 10 minutes. Remove the ricotta from the sieve to a medium bowl, discarding the liquid. Feel free to toss in some fresh herbs here, oregano or thyme would be delicious. You could also drizzle some lemon-infused olive oil on top. Enjoy. 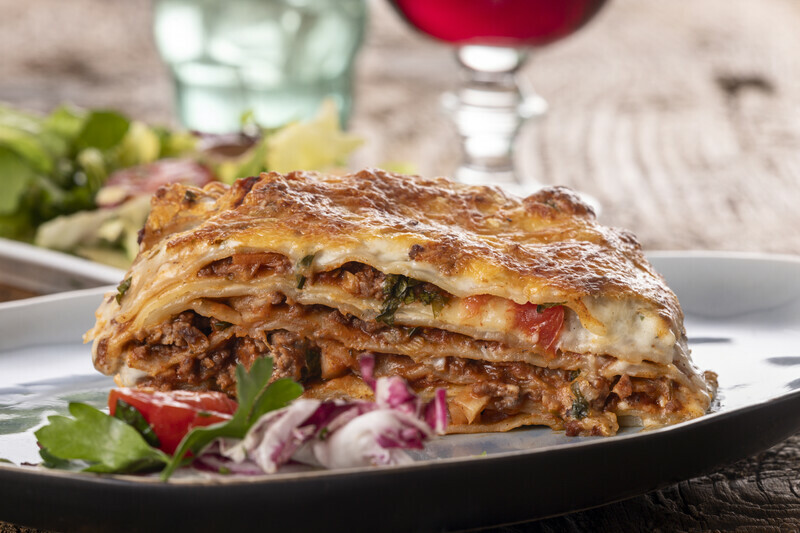 This authentic lasagna recipe takes just over 3 hours from start to finish, but so well worth it for one of your main dishes. Serve with some garlic bread and a simple salad. In a large dutch oven saute the sausage, onion, and garlic over medium heat until well browned. Next add the tomato sauce. Season with fresh basil, Italian seasoning, salt and pepper and half of the fresh chopped parsley. Simmer covered for approximately 1-1/2 hours, stirring occasionally. Bring a large pot of salted water to boil. Add 1 TBS of vegetable oil to water, preventing the noodles from sticking. Cook noodles al dente. Drain and rinse in cold water. In a bowl combine ricotta cheese, eggs and remaining parsley with 1/2 tsp salt. First spread 1-1/2 cups of the meat sauce in the bottom of a 9x13 pan. Place 6 noodles lengthwise over the meat sauce. Spread 1/2 of the ricotta cheese mixture over the noodles. Top with 1/3 of the mozzarella cheese slices. Spoon and another 1-1/2 cups of meat sauce over the cheese slices and sprinkle with 1/2 cup grated Parmesan cheese. Repeat layers and top with the pepperoni - remaining mozzarella and Parmesan cheese. Cover with tin foil that was sprayed with vegetable oil on one side to prevent cheese from sticking. Make certain the foil does not touch the cheese. Time to place in the oven and bake for 25 minutes. Remove the tin foil and bake an additional 25 minutes. Let rest for 15 minutes before serving. Get your garlic bread ready and then serve your main dish.